Although DAVI could take no direct credit for these acts, the years following passage of these federal law were years of mushrooming growth for the audiovisual field and DAVI. As schools and colleges purchased more AV equipment and materials they needed specialized professional staff to oversee and promote their use. Thousands of new jobs were created, and many of the job holders joined DAVI. In 1960 the name of the association was altered by dropping the hyphen between Audio and Visual. Thereafter in was the Department of Audio Visual Instruction. In 1958 Anna L. Hyer, who had joined the staff under J. James McPherson, been associate executive secretary to Floyd E. Brooker, and who had a doctorate in Audio-Visual Education from Indiana University, was named the new executive secretary. More than a just a manager, she was respected as a visionary. She was among the first to point out that the real value of educational media lay in its ability to bring about structural change at the system level, and that instructional technology’s future lay in the realm of the school administrator, not the teacher. 1962-1963, Clyde K. Miller, director of Division of Audio-Visual Education, Ohio state education department. 1960. The 1959 convention program had no mention of programmed instruction, but there was a major session in 1960 on "Programmed Instructional Materials for Use in Teaching Machines.” This title gives a clue to the link between AV administrators and programmed instruction—the machines that were initially used to deliver the programmed lessons. When schools and colleges acquired teaching machines someone had to take care of them—the AV coordinator. The primacy of the machine was indicated by the name that marked this special interest group at the next several conventions: the Teaching Machine Group. Gradually, though, the emphasis shifted to designing and utilizing interactive self-instructional systems. The concept of "technology of teaching” was popularized by B.F. Skinner in 1968 to describe his view of programmed instruction as an application of the science of learning, which supported the notion promoted earlier by James D. Finn that "instructional technology” could be viewed as a way of thinking about instruction, not just a conglomeration of devices. Thereafter, technology had the dual meanings of "application of scientific thinking” and the various communications media and devices (pdf). Finn became the most visible leader in the field during the early 1960s. One of the activities that brought him to national prominence was the two-year Technological Development Project. The sometimes confusing proliferation of new terms—for new concepts or new devices—led to the formation of the Commission on Definition and Terminology. It was chaired by Donald P. Ely, who would be elected a year later as the youngest president-elect of the association up to that time. In 1963 the Commission produced The Changing Role of the Audiovisual Process: A Definition and Glossary of Related Terms. 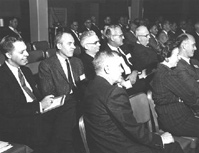 The commission affirmed the term "audiovisual communications” as the central concept of the field, defining it as "that branch of educational theory and practice primarily concerned with the design and use of messages which control the learning process.” One small outcome of the 1963 Definition book was a consensus on the contemporary spelling of the key word "audiovisual.” From 1963 onward, this spelling replaced the original "audio-visual” spelling. A more significant outcome was the commission’s affirmation of the value of communication theory as one of the fundamental pillars of the field and their acknowledgement that the central concept of the field was "technology as process” rather than "technology as product.” The editor, Ely, acknowledged that the commission had settled on the traditional term "audiovisual” as the name because of its continuing popularity, but were willing to substitute another term as soon as one had gained popular support. It would take another decade for the term "educational technology” to become fully accepted. As the focus of the association shifted away from helping teachers use media to designing self-instructional systems, the connection with the National Education Association, which was increasingly functioning as a teacher’s union, became strained. A constitutional change within the NEA in 1968 requiring departments to become integrated into the association brought matters to a head. At the same time, the proliferation of sub-groups within DAVI (e.g. educational film, audiovisual materials, teacher training, instructional television, programmed instruction, graphic design, and instructional design, among others) was diffusing the focus and therefore the influence of the association…in other words, an identity crisis. In September 1969 Anna L. Hyer and other senior staff members stepped down from their DAVI posts in order to remain in their positions at the NEA, which had actually been their employer all along (and where their pension benefits were vested). The Board selected Howard B. Hitchens, Jr. to succeed her, with the new title of executive director. Hitchens had been director of instructional technology at the Air Force Academy and had a doctorate in the field from Syracuse University. 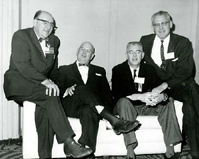 The Board of Directors that met in the summer of 1969, chaired by Lee E. Campion, was faced with a set of momentous decisions, thrust upon them by the reorganization of the NEA. They had the challenge of essentially reinventing the association. They authorized a vote of the membership on a new name and independent structure for the association. There was vigorous debate among the membership about what key words should be used to identify the association. "Technology” had a lot of support in California, while "communications” was favored in New York and the East. In a political compromise, one of the names offered to the membership for vote combined elements of both. The vote count in June 1970 showed a 3-to-1 preference for the hybrid name, Association for Educational Communications and Technology (AECT). The change became effective immediately, although it was not official until ratified by the board and the membership at the 1971 convention. 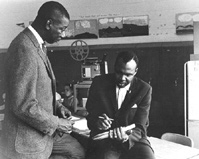 1969-1970, Lee E. Campion, director, Division of Educational Communications, New York state education department.